Chainsmokers: Drew Taggart and Alex Pall. 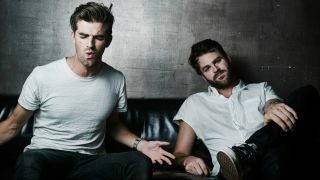 The Chainsmokers' single Closer (featuring Halsey) helped to soundtrack the summer, and topped the charts on both sides of the Atlantic. Earlier in 2016, the US duo - AKA Drew Taggart and Alex Pall - scored hits with Don't Let Me Down (featuring Daya) and Inside Out (featuring Charlee), while recent release All We Know (featuring Phoebe Ryan) also charted around the world. These singles are now available together on Collage, The Chainsmokers' second EP, which also features a new track, Setting Fires (featuring XYLØ). "When we started producing we would load our sessions full of different sounds on top of each other in an attempt to make our production sound unique. Eventually, we realised that this was just mudding up our mixes and taking away from the effectiveness of the main instruments we had selected. "Today we are really careful about the sounds we use. We try to find one great sound that stands out on its own. For example, in Don't Let Me Down, we spent a while making the main guitar sound really strong so that we wouldn't have to add a bunch of layers to it. "Also, if you are interested in 'loudness', the fewer sounds you have in your production the better." "We don't always feel inspired. We used to spend weeks sitting in the studio trying to force an idea out before we realised that a truly great idea reveals itself when it wants to, and when it does you have to capture it. "Sometimes they come at an inconvenient time like when you are falling asleep or riding in a car. You have to do your best to either voice memo it or write it down. Do whatever you can to hold on to it until you have the time and resources to develop it." "We are really careful about the sounds we use. We try to find one great sound that stands out on its own." "Music is about feeling. If you start something that you loved at one point but it has become stale, move on. Don't feel like you have to finish an average idea on principal. "Also, don't feel like that idea is gone forever. There have been countless times when we have brought back old melodies or lyrics when we've needed them for new songs." "You know those days when whatever you play on the piano or guitar just feels boring or stale? You are probably burnt out on that instrument that you made your last four songs with. "So, find a new toy. We always joke about how some of our most successful songs were written immediately after purchasing a new instrument. A new sound will take your creative mind and the songwriting process to a new place." "Yeah, it's true, drums are everything, especially when you are following the 'less is more' rule. It's worth putting the time into your drums sounds. This doesn't mean that you should avoid sample packs, but you should take those sounds and make them your own. "Also, get creative and make some yourself out of unconventional sounds. We were in the studio with Jonsi from Sigur Ros and he was playing this drum kit he had made from his vocals and distortion. We always get inspired by stuff like that! "Also, think about your chords! If they evoke enough emotion on their own, you won't find yourself adding unnecessary layers later on in the songwriting process."